Grouper aquaculturists were hopefully all the wiser after 19 days of training during the Grouper hatchery training for the Philippines. Conducted from April 7-25 at AQD's Tigbauan Main Station, the training covered both lectures and hands-on practical sessions. 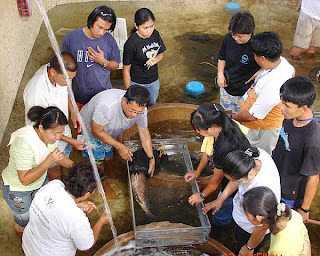 The trainees were put through their paces in areas such as biology of grouper; site selection; hatchery design and construction; broodstock management and spawning; production of natural food; disease diagnosis; fish health management; larval and nursery rearing; fish nutrition; and grading of fry and fingerlings. Special topics on cage design and culture of marine fish and business planning, marketing management and economic indicators were likewise discussed. The training was fully funded by the Australia Centre for International Agricultural Research (ACIAR). The Network of Aquaculture Centres in Asia-Pacific (NACA) was the coordinating agency. Mr. Barney Smith of ACIAR and Mr. Sih Yang Sim of NACA dropped by during the training. The 15 trainees were Mr. Stephen Abamo, Mr. Reynaldo Acap, Mr. John Aloria, Ms. Bernabe Aquino, Mr. Reynaldo Benson, Ms. Arlyn Carroz, Ms. Minvilu Casido, Mr. Primo Ebesate, Mr. Alan Failaman, Mr. Arnel Gabasa, Ms. Tina Marie Hautea, Mr. Jovert Javier, Mr. Oliven Lagua, Mr. Tito Piloton, and Ms. Ma. Caroline Tejero. There were five (5) observers from the private sector including one from LGU Aklan. Thank you for every other informative website. Where else may I get that kind of information written in such a perfect way? just I want tto suggest you some attention-grabbing issues or advice.